Strong Over 50 is designed to help your body build and maintain muscle, lose weight, and increase mobility, balance and function. SO-50 uses a new, patent-pending piece of equipment, along with accessories, to provide a suspension fitness training system with a focus on safety. Fitness Plus in Lexington, Ky., is the exclusive distributor of the Strong Over 50 product and program for the state of Kentucky. John Stuef, owner of Rapid Fitness in Raleigh, N.C., worked with a team of exercise physiologists over a 5-year period to develop and manufacture the Strong Over 50 (SO-50) system. The patent-pending rack equipment is made of aircraft-grade aluminum, corrosion-resistant Delrin bearings, heavy-duty grips and a height adjuster. Exercise accessories for the SO-50 system include an ab strap, door hanger and mounting strap with carabineer. Focusing on body weight suspension, the SO-50 specialized workout routines allow individuals of all ages and fitness levels to improve their balance, endurance and core strength. Are you strong? Why should you be strong? Here are some facts. 1. The 6th leading cause of death after age 60 is from injuries due to falls. Proper strength training improves balance. 2. After age 40 your body starts losing 2 to 3 percent of its muscle a year. Less muscle also means a weaker internal system including your heart, lungs and liver. 3. Less muscle = lower metabolism, which leads to weight gain. 4. Adults 45 and over who sit more than 11 hours have a significant increase in risk for early mortality and other key health issues. There’s hope and help. It’s the program called Strong Over 50. Our educated, experienced trainers at Fitness Plus use the cutting edge SO-50 training device as part of your personal, functional, efficient workout. 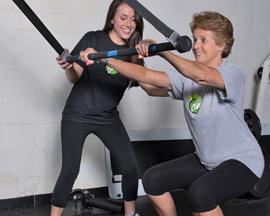 If you are a gym owner or personal trainer in Kentucky who wants to offer the Strong Over 50 system to your own clients, read about the Strong Over 50 certification program offered by Fitness Plus.